Thread: Who's going to RMAF 2018? Re: Who's going to RMAF 2018? I'm skipping it this year. 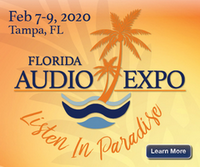 Plan to attend AXPONA in 2019. I'm thinking about it....the whole LA debacle making me want to. Anyone thought about having a sharkfest gathering at RMAF? Sure! You want to organize this one or should I? We are going and showing with CH Precison and Gobel High End. We will also have a TW Acustic table. U.S. Premier of the Gobel Aeon Reference speaker. Please stop by the Iris Suite on the first floor near the restaurant. As I previously posted RMAF again conflicts for the second year in a row with a a home football game. Had I not already missed one game due to a nephews wedding I may have skipped the game and come out. My concern is that I have Googled RMAF 2019 and I get nothing, zip, nada. As I recall future dates have always been posted in the past. With the move of Axpona to the fall for 2020 am I the only one concerned. If you have any info please post.